The above quote caught my attention this week. There are areas of our lives, usually long ago in our pasts, but not always, that are wounds in our souls. We experienced something at the hands of others that caused us hurt. That injured us, physically, mentally or emotionally. And very often it is only with life experience, and the benefit of hindsight that we are able to look back on the hurt and find some measure of benefit. My childhood had experiences of great harm. It has taken me many years to work through the pain and emotional scars left behind. Recently, though, I realized that the experience, horrible and painful at the time and for many years after, has given me some greater insight into certain areas of life. I’m not saying I couldn’t have gained that insight in a less painful or emotionally devastating way, but the experience itself provided me with a benefit that I can now see and verbalize. I still have no wish to be in contact with the perpetrator of my experience, but I can look at the experience in a different light. I can see with different eyes. The forgiveness, the letting go of the anger and hate and resentment, is not for the perpetrator of these acts. It is to release the toxic energy from my soul that has lived there for far too long. It is to brush away the dirt from my heart. It is to push back the curtain that has been covering my inner light, darkened and obscured by old wounds and hurts. 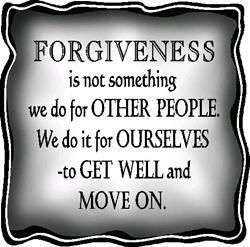 Forgiveness is not for the other…it is for me, and you. Do you have a hurt in your life, one that has festered and swelled, blocking out your light and spirit? Are you able to look for the benefit of the experience? Did it teach you something about yourself? Your resilience? Your strength? Your power? Can you find some insight? I encourage you, peel back the cover on that dark place in your heart, and see if you can look at the hurt with different eyes. See if you can find a way to say “Thank you for that experience”. See if there is a way to say: that experience helped me to grow as a person. See if there is room there to forgive. Not for the other…but for yourself…so you can heal and move forward. You deserve to forgive and heal and move forward. You are valuable and worthwhile. Clear the darkness from your soul. This entry was posted on November 19, 2011 by Corrie Beebe in forgiveness, growth, lessons.